Another reason was plant availability. The British rock gardeners were growing mostly plants native to the Alps and other high altitude regions of continental Europe. Some of these plants failed to grow well in parts of America, while our own mountain ranges were full of other alpine plants that were better adapted to the conditions. 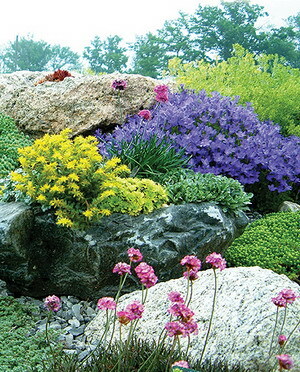 American rock gardeners also relaxed the rules here, feeling completely free to include lower altitude plants that “looked right” in a rock garden setting, including both native and exotic species. Why struggle to grow a fussy high-altitude plant when something else will grow perfectly fine, serve the purpose and look better for the effort? The American style varies widely and is hard to define, but the main points are: use local materials that look “right” for your region, then grow alpines, natives and any other plants that look right to you in the setting. It’s really the materials and plant selection that set this style apart from a more traditional English Rock Garden. See our English Rock Gardens page for soil and construction tips and ideas on how to start laying out your plants. Reginald Farrer wrote the “rock garden Bible” for England, but eventually America found it’s own information goldmine in Rock Gardening: A Guide to Growing Alpines and Other Wildflowers in the American Garden written by Lincoln Foster in 1968. This book is truly a must-read for the serious rock gardener. The American Rock Garden Society had its origins in the 1930s and now has 35 regional chapters, including five in Canada. 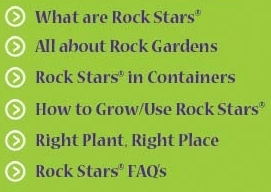 These groups are a terrific opportunity for learning from more experienced rock gardeners, and other benefits such as newsletters, garden tours and seed exchanges are well worth the low membership fees. 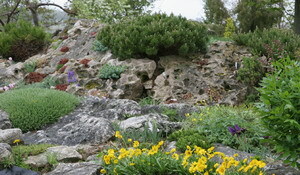 For other regional rock garden societies as well as gardens to visit, see our Resources page.